Updated photos from the Design Selection! Haruna has modeled for the magazine “KERA,” the representative magazine of Harajuku fashion. In order to decide a design for the URAHARA x Luna Haruna Collaboration Slip-On Sneakers, she came to our Tokyo Otaku Mode office! We’re looking forward to seeing what kind of sneakers she’ll design! Fast-forward to the start of the design process. Haruna says that when it comes to fashion items, she loves shoes the most. When we told her about the project, she immediately went into serious mode. 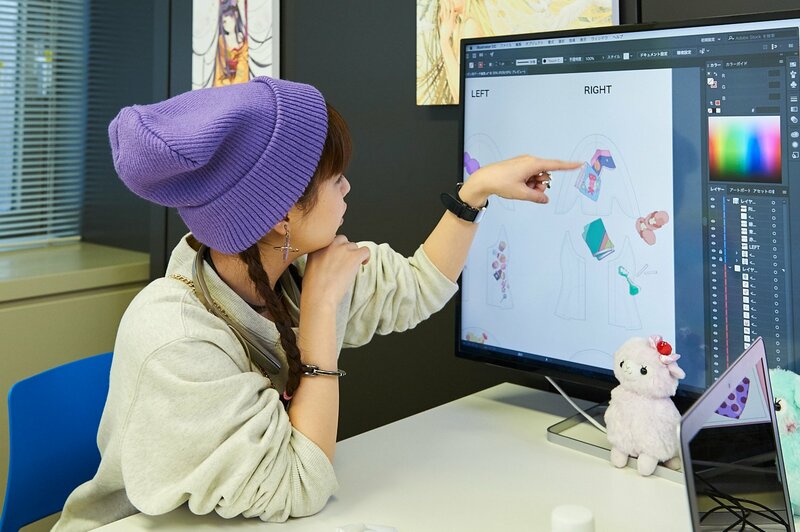 Next to her, Haruna’s stuffed alpaca Minami-chan watches over the project’s progress. Items are chosen for the instep, above the toes. Slip-ons have a large instep that decides a viewer’s first impression, so it’s a very important part! A lot of food shows up in the URAHARA anime, but “sweets” seem to make up the main part of the slip-on’s design! Next, the design for each side is decided. The sides have very little surface area and many minute adjustments are needed to line up the items, so Haruna is choosing carefully. Other than food, plenty of accessories, cute furniture, and other various items show up in the URAHARA anime, so be sure to check them out! When you look at the screen, you can see the words “LEFT” and “RIGHT.” Does this mean that the left and right sides will have different designs!? Finally, Haruna decided all of the color schemes. 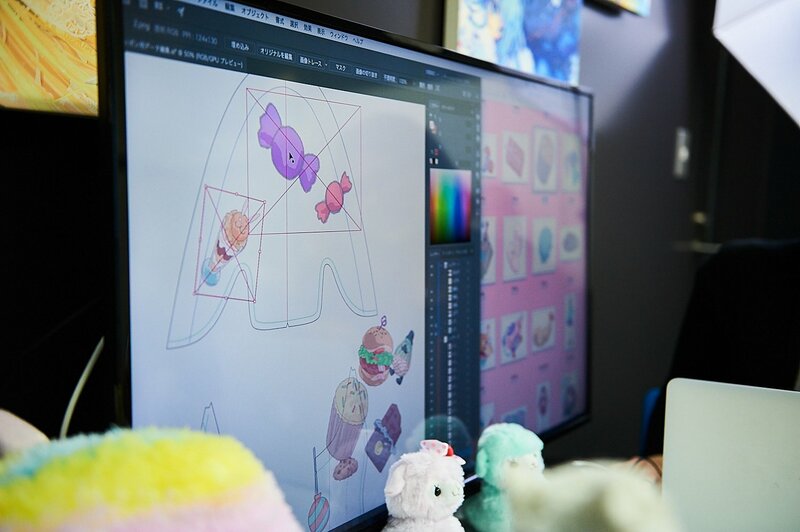 Here we’ve shared with you a few photos of the design meeting with Luna Haruna, where she thought up ideas with all her might in a short amount of time. We have a hunch that the completed, creative slip-ons will perfectly match URAHARA’s theme! 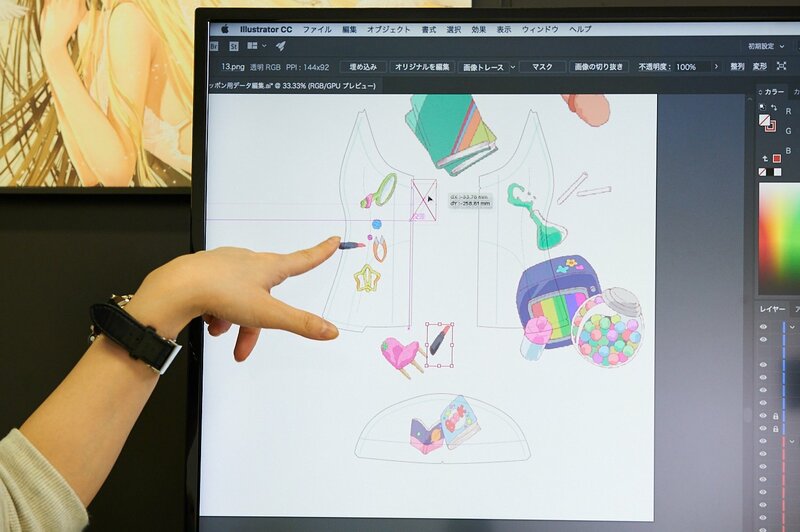 Using the items that Luna Haruna chose, we’ll create a final version of the design and manufacture a sample. Until these one-of-a-kind URAHARA slip-ons are completed we’ll continue to update this page with more information, so check again soon!